When to board a train, you expect to arrive at your destination roughly on time. Sure, there are a lot of reasons why you may experience a delay — a tree falls on the track, a passenger falls ill, or heaven forbid, there’s a train accident. But you don’t expect to be delayed because the person driving the train walks off the job mid-trip. And yet, that’s exactly what happened in Spain in September of 2016. 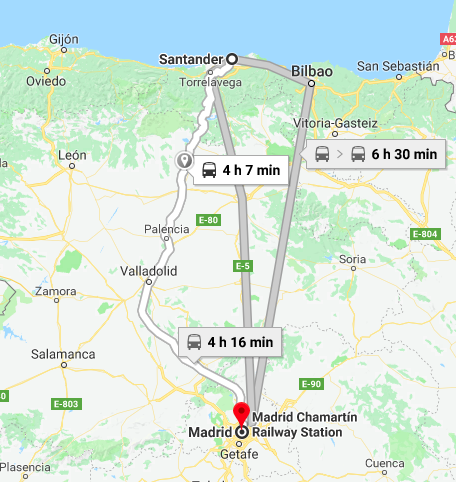 At 7 PM that evening, a train left the city of Santander on its way to Madrid, with an estimated arrival time of 11:15 that night. The train made a scheduled stop to pick up and drop off passengers in the village of Osorno. (The map, above, shows the route in white.) Passengers weren’t the only people scheduled to disembark, though. The driver’s shift had ended and he was supposed to be relieved by a new driver, but his replacement didn’t show up. Instead of continuing the trip — there was about two hours left to go — he simply called it a day. Passengers were understandably furious as they were stranded for roughly three hours as Renfe, the company which operated the train, tried to find a replacement driver. The train finally arrived in Madrid at 2:30 AM, and the 109 people on board were all given full refunds for the absurd inconvenience. But the seemingly irresponsible driver? He wasn’t fired. According to the Guardian, “under Spanish law, train drivers are not allowed to work for more than six straight hours to prevent fatigue and avoid accidents.” And that — driver fatigue — is a real problem. In September of that 2016 and again in January of 2017, trains crashed because the engineers were simply too tired. In total, more than 200 people were injured, one died, and the infrastructure involved suffered perhaps as much as $10 million in damage. And those are, relatively speaking, good outcomes — a few years prior, a train crash in the north of New York City claimed four lives. Viewed through that lens, the seemingly irresponsible actions of the Spanish engineer may have been quite the opposite. And just to be clear, his union rep told the Guardian, safety was the driver’s reason for leaving the train: “it is not because he decided to leave to go home.” Rather, they argued, he didn’t think it was safe to continue onward. Renfre, apparently, agreed; there are no reports of them firing the driver who walked off the job. Bonus fact: Lack of sleep can also lead to car crashes, as you’d imagine. And that makes a certain Monday a bit more dangerous. The good news for those of us in the United States: you’re past that Monday — the culprit is the switch to Daylight Saving Time. According to this research paper, there is a “significant increase in accidents for the Monday immediately following the spring shift to DST,” as commuters’ internal clocks are off, and because they simply didn’t get enough sleep over the weekend. From the Archives: Hey, Let’s Crash Two Trains Together! : A very, very bad idea.